The PAF - Buck the Hum and Buck the BS! When it comes to what makes PAF’s, PAF’s… some guys go on and on about cosmetic matters such as “tooling marks” and other such nonsense. That’s basically just smoke and mirrors. If you know anything about how pickups actually work, its all about magnetic induction - and then how the pickups interpret that information, and then how that signal gets sent to your amplifier. That’s what makes a PAF Humbucker pickup sound as it should. Most pickup makers are only seemingly concerned about making pickups that look like PAFs, of course Tom Doyle's TRU-CLONES PAFs look like the real thing, but more importantly they have that elusive authentic tone that only comes from a true understanding of this exclusive, very specific formula and proper building technique. 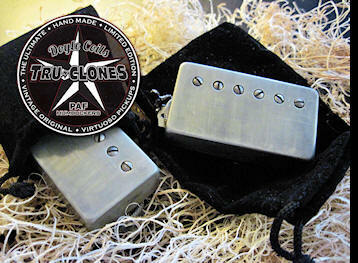 Our Doyle Coils TRU-CLONES PAF pickups are meant to be Vintage correct in how they look and feel, certainly… However, we don’t spend a whole lot of time on things like tooling marks, and circles inside of squares, etc, etc. That stuff brings absolutely nothing to the party… we assure you! 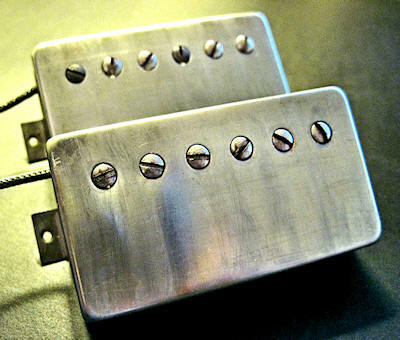 We are not trying to fool anyone that these pickups are the actual original ’57 through ’59 PAF pickups. They are not meant as an attempt to be a counterfeit product, hence you will not see the “Patent Applied For” sticker on the back of Tom’s pickups… just his proud maker’s mark. There’s an actual science to why those old PAF pickups sound as they do… and sure a little “black art” and mojo get thrown in for good measure. What we spend our time creating here is all about understanding electronic and magnetic induction, transduction, proper magnetism and flux field, improving the signal-to-noise ratio, vibrational resonance, current flow, and of course… all of that equals tone. Oh that sweet, sweet tone… the one that’s in your head, and on that favorite album you grew up listening to. We get it… after all, Tom was there! He has enough stories to fill ten books. You should hear the one about Les dragging Tom into NYC back in ’69 to meet these guys that were recording their 2nd album. Turned out to be some young guys calling themselves ‘Led Zeppelin’ or some such! Tom had already been working with Les for 7+ years at that time. Tom has handled and worked on countless early Kalamazoo Gibson pickups with Les Paul right there at his side. Tom and Les took them apart, put them back together, reverse engineered them, experimented on them, installed them in countless guitars, rewound them, added stuff, took stuff away, compared them, and explored the innumerable variables that made these humbucker pickups sound the way they do. They changed the magnets, degaussed them, added copper winding wire and took some off, changed the pots and caps, switches, signal paths, etc, etc… All in the interest of chasing that elusive balance, signal, and “perfect tone”. Tom has been making custom hand-made pickups since the mid 70's... way before it was "the thing to do" or cool, or trendy. Hell... even before most of today's pickup makers were out of junior high school, for that matter! Tom Doyle was Les Paul's personal guitar tech, luthier, co-inventor, soundman, confidant, and "fixer" for 45 years... right up until the time of Les' passing. Suffice it to say that all that time at the side of "The Master" has given Tom the experience and know how that no one else on the entire planet can possibly have. He and Les Paul worked together refining and redefining what an electric guitar could and should sound like... a true labor of love that still lasts till this day. Now you can have a piece of that history. Many have come along and attempted to recreate the sound, look, feel, and tone of the famous '57 PAF Humbucker that is "the sound" in every tone chasers head throughout the world... and some have come close, others not so close. However, none have had the first hand knowledge, the actual day-to-day first person experience and the hands on background that Tom Doyle has. Tom is nothing less than a walking, talking historical encyclopedia of all things Les Paul, guitars, electronics, sound, and musical history from the last 50+ years... from the artists to the instruments, to the gear they were using, to the experiments they tried, and everything in between! Tom has been called "The Luthier to the Stars". These pickups are hand made, one at a time in the USA with the very best & highest quality vintage correct components available. Get yours now... Supplies will be limited. 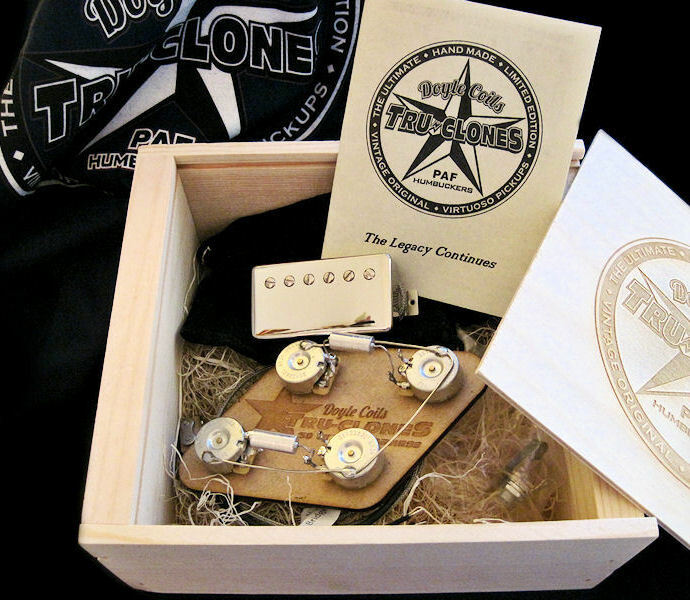 When you get a set of these Limited Edition Doyle Coils TRU-CLONES PAF '57 Humbuckers...  Your Tone Quest just might be over! These Vintage '57 PAF Humbucker Pickups are spot on Vintage recreations of the originals... Undeniable '57 PAF reproductions in every single way. Cosmetically of course – with all the proper Vintage components, electronics, all of it... The vintage 42 gauge wire, the butyrate bobbins, the nickel silver base plates, the maple spacers, the degaussed long cast magnets, the proper vintage screws, the unpotted nickel covers, etc, etc... and with all the punch, bloom, articulation, tone, and control that the original late 50's Kalamazoo pickups had in those famous Les Paul Bursts... and maybe just a little more!